Cook the spaghetti in a large pot of boiling salted water according to the package directions. Drain the pasta, reserving 1/2 cup of the cooking water. While the pasta cooks, add the bacon to a large skillet set over medium heat. Cook, stirring occasionally, until the fat renders and the bacon is crisp. Add the onion and pepper to the pan, and continue cooking until the onion softens. Meanwhile, melt 1 tablespoon of the butter in a small skillet set over medium-low heat. Crack the eggs into the pan and cook just until the whites are set (the yolks will still be runny). Remove the pan from the heat and keep warm. Add the garlic to the pan along with the bacon and onion and cook, stirring constantly, just until fragrant, about 30 seconds. Add 1/4 cup of the reserved pasta cooking water, scraping the bottom of the pan to release any browned bits. Reduce the heat to low, and add the drained pasta to the pan, followed by the remaining 2 tablespoons of butter. Once the butter has melted, turn off the heat under the pan. Gradually add the cheese, tossing the pasta with tongs to incorporate. After you’ve added all of the cheese, you can adjust the consistency of the dish with the remaining reserved pasta cooking water. 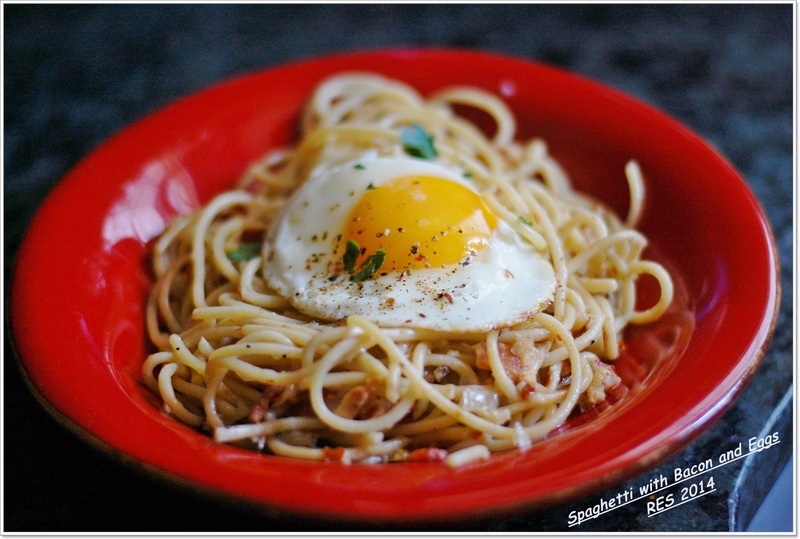 Divide the pasta between two bowls, and top each serving with one of the fried eggs. Garnish with the chopped parsley and season to taste with salt and pepper.